Be the first to share your favorite memory, photo or story of Marilyn. This memorial page is dedicated for family, friends and future generations to celebrate the life of their loved one. 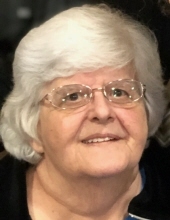 Marilyn A. McDermott (nee Knuth) of Mt. Laurel, NJ, died January 14, 2019. Age 79. Beloved wife for 54 years of the late Thomas L. McDermott, Jr. Loving mother of Patricia M. McDermott of Mt. Laurel, NJ; Theresa L. Klingler (John) of Mt. Laurel, NJ; Barbara A. Hubbard (Dennis) of New Smyrna Beach, FL; Mary Jane Montermuro (Al) of Cinnaminson, NJ; Thomas L. McDermott III (Dianna) of South Jordan, UT; Colleen A. Mivelaz (Troy) of Cherry Hill, NJ and Alexander C. McDermott of Mt. Royal, NJ. Devoted grandmother of 7 and great grandmother of 2. Dear sister of Kathy Olsen (Al); Lorraine Gilboy (Paul) and the late Joan Regan (Bill). Viewing Thursday evening 7 to 9pm in the Schetter Funeral Home, 304 W. Marlton Pike, Cherry Hill, NJ 08002. Relatives and friends will gather for Mass of Christian Burial Friday 11am in The Catholic Church of St. Mary 2001 Springdale Road, Cherry Hill, NJ 08003. Interment Calvary Cemetery, Cherry Hill, NJ. In lieu of flowers donations may be made to Samaritan Healthcare and Hospice or a charity of your choice. To send flowers or a remembrance gift to the family of Marilyn A. McDermott, please visit our Tribute Store. "Email Address" would like to share the life celebration of Marilyn A. McDermott. Click on the "link" to go to share a favorite memory or leave a condolence message for the family.